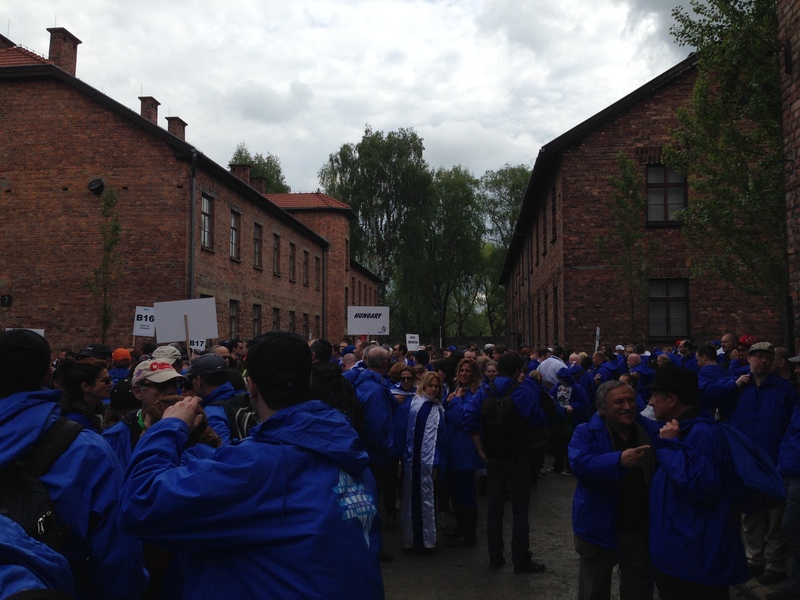 As many of you loyal readers know, I have just returned from Poland, where I participated in the March of the Living (MOL) from Auschwitz to Birkenau. 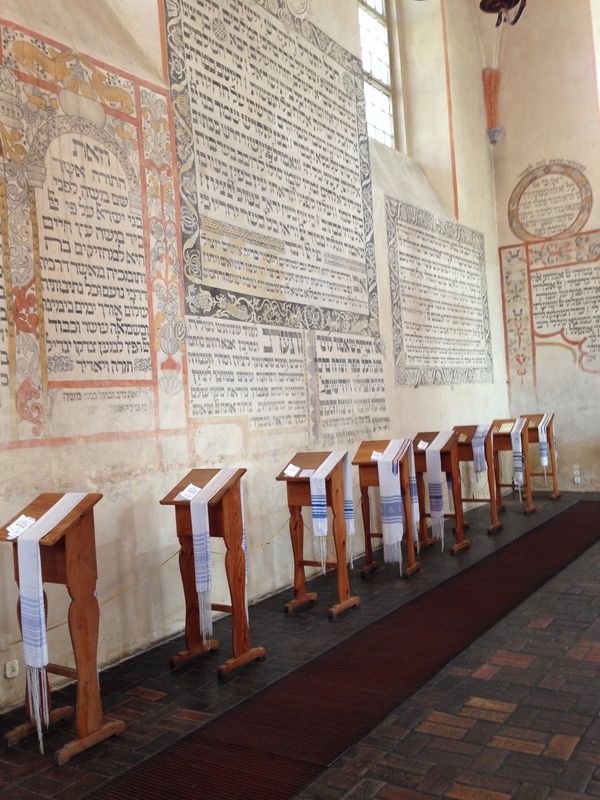 The trip itself is a 2-part educational journey, from Poland to Israel. Originally designed for 17-year old students, there was so much interest that there is now an adult trip, as well as a young adult trip. For more information, click here. A bit of background: I went to Prague for my 30th birthday, 16 long years ago. It was a magnificent city. And I hated it. For me, it was like the Epcot Center for dead Jews. We went to Terezin (Theresienstadt), a concentration camp masquerading as Jewish settlement, complete with gas chamber and crematorium. Thousands of people were murdered there and, after visiting the town/camp, I had no interest in seeing any others. Until January 2014 when I attended an exhibit at the UN in NYC. Entitled “When you listen to a witness, you become a witness”, the event showcased photos from previous Marches, as well as testimony from survivors. As the survivors spoke it was impossible not to be moved to tears. 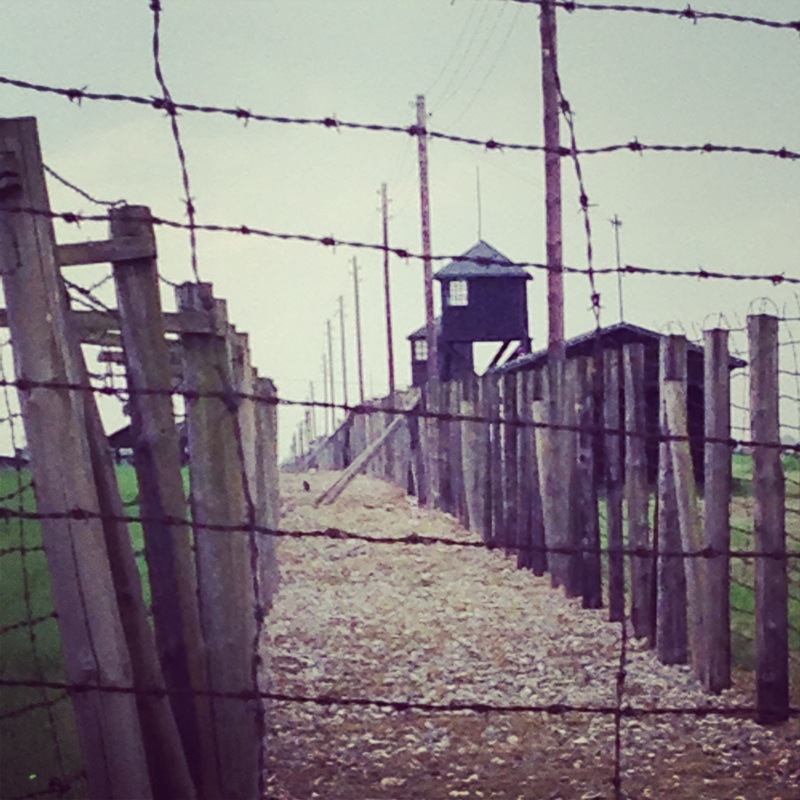 I decided I wanted to join my parents on the March of Living, to travel to Poland and visit these places with people who survived the horrors. I wanted to bear witness, and hear the stories first-hand, before those who had survived were no longer alive to tell their stories. As the departure date neared, I couldn’t help but wonder what on earth I was thinking. Why was I choosing a trip of tears? Why hadn’t I just booked a beach vacay? Friends and family were wishing me bon voyage with some trepidation – no one wanted to say “have fun” or, “enjoy”. It simply wasn’t that kind of trip. Was it? 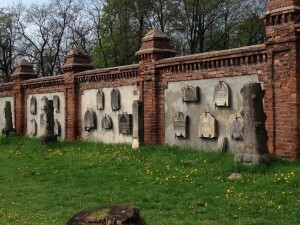 The night before I left, my Man and I spent some time on-line, googling Poland and Warsaw and checking out what else there was to see, aside from death camps and cemeteries. Admittedly, I was nervous to go to a place where, in my mind, they hate Jews. First thing I learned was that, among all the Nazi-occupied countries in Europe, Poland was the least collaborative. 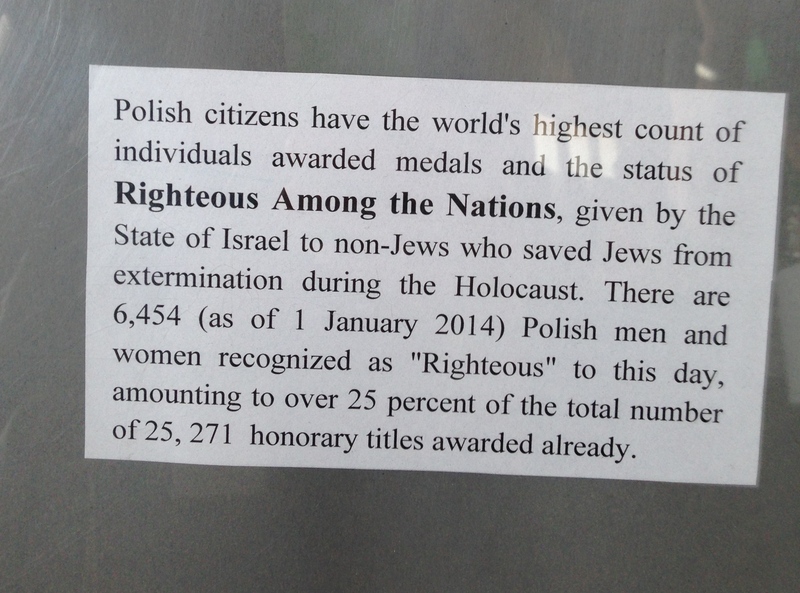 In fact, of all of the “Righteous among the Nations”, the highest number came from Poland. LOT Polish airways was phenomenal. The flight attendants were lovely and helpful and friendly. Was this a taste of the Poland to come? Turns out, it was. 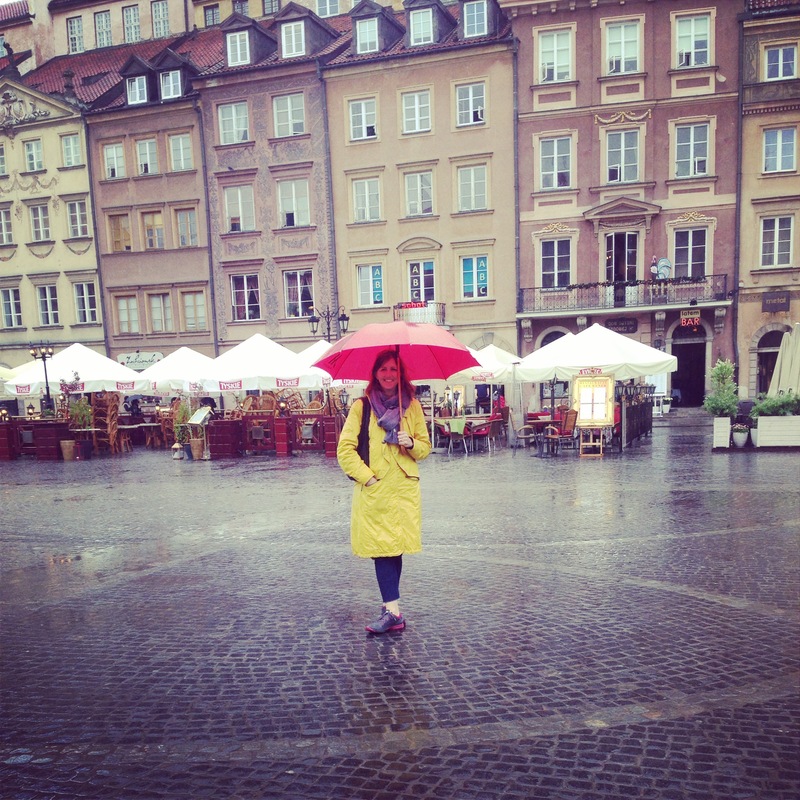 When my bag disappeared and I arrived in Warsaw without a change of clothes, I hit the local mall where the people I dealt with were nothing but nice. And normal. It was like being at Yorkdale, just a lot whiter. A lot. Being used to multi-culti Toronto, that was the one thing that stood out in Poland. With the arrival of 3 busloads of Toronto-based Adults, our trip began in earnest. 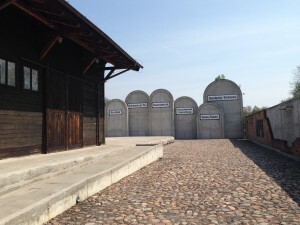 First stop were cemeteries in Lodz and Warsaw, with a visit to the Radegast train station memorial, the sight were thousands of Jews were deported from the Lodz ghetto to certain death. It was a long day with tired, jet-lagged people and an overwhelming amount of gravestones. With each stone, a story: LL Zamenhof, an opthamologist who created the international language of Esperanto; Marek Edelman, a commander of the Warsaw Ghetto Uprising who survived, participated in the Warsaw Uprising and eventually died in Lodz in 2009, age 90; Janusz Korcak, the Dr Seuss/Dr Spock of the day, a famous educator and pediatrician, who ran an orphanage in the ghetto. When offered shelter on the Aryan side, as well as special treatment, he refused, sticking with “his” children – all the way to Treblinka where they were all murdered. The list goes on….At the Lodz cemetery, thousands of markers have been placed by Israeli soldiers to commemorate those who were killed. 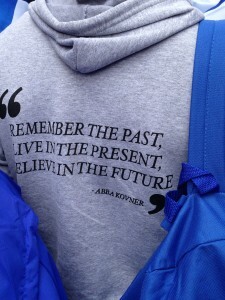 Each year, more are added to the growing field of memory. 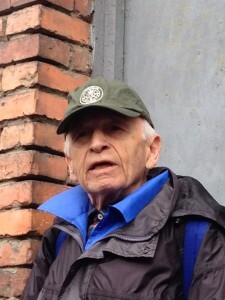 Our brilliant tour guide, Mike Hollander, reminded us at every turn: for the Poles, the Holocaust was a Polish tragedy in which 6 million Poles died, half of them Jewish. 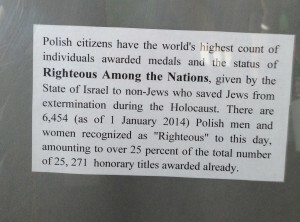 This can be seen at the Treblinka memorial. Treblinka, a death camp in which over 800,000 human beings were murdered was destroyed by the Nazis as they retreated. 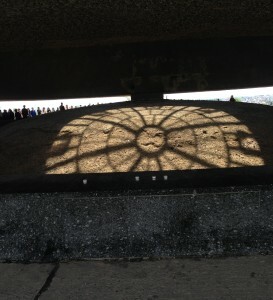 It is now a contemplative, beautiful memorial built by the Polish government as “a tragic monument of martyrdom”. Over 130 stones have been placed, each to commemorate the name of a town from which Jews were deported and killed. 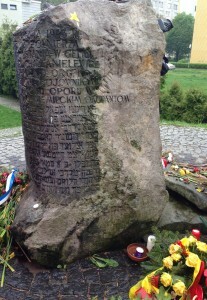 One such town was Tykochin where, in the summer of 1941, 2000 Jewish men, women and children – half of the town’s population – were taken from their homes. 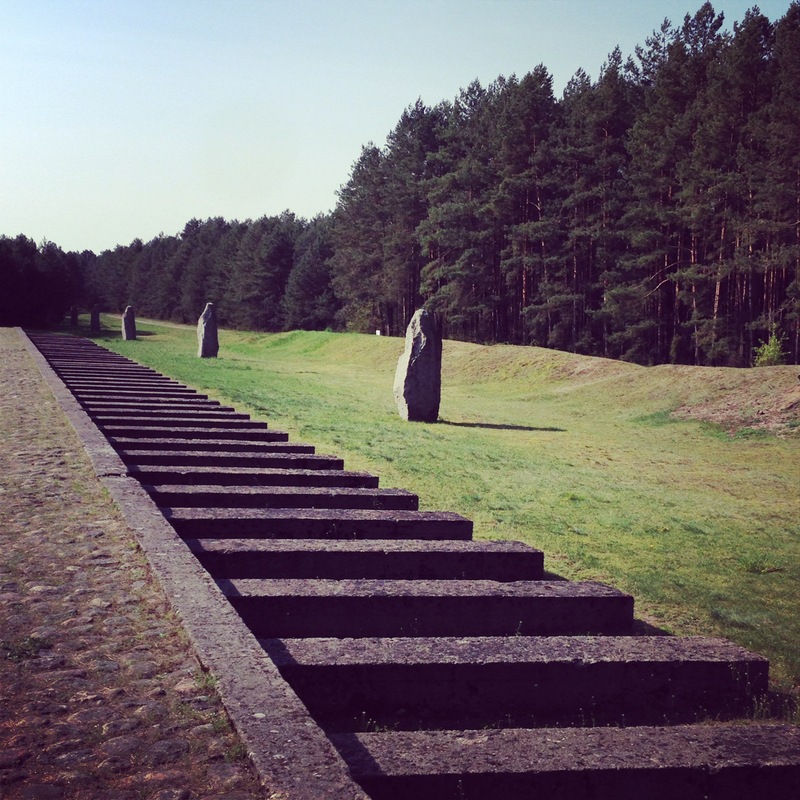 Marched into the nearby Lupohowa Forest, they were forced to dig ditches before being shot. An entire town, obliterated in a matter of hours, buried in a handful of mass graves. 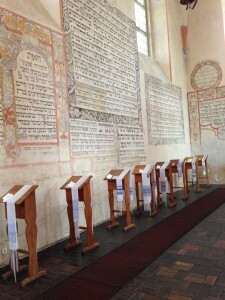 The synagogue still stands in Tykochin, a memorial to the town’s once thriving Jewish community. One of our accompanying survivors, Irving Eisner, led our group in a rousing sing-song in which it was impossible not to partake. We spent a day wandering the rainy streets of Warsaw: the gorgeous and interactive Chopin museum; the Historic Centre of Warsaw, completely rebuilt after being destroyed by the Germans and now a UNESCO-heritage site; the New Museum of Jewish Life; memorials to the Ghetto uprising; Mila 18 – the bunker the heroes of the Warsaw ghetto uprising used as their headquarters. For those who’ve read the Leon Uris novel, it was a bit of a pilgrimage! Next stop: Krakow. We visited the old Jewish quarter, the ghetto, and the pharmacy belonging to Tadeusz Pankiewicz, a Catholic Pole who rescued many Jews and who bore witness to the abuse, deportation and death of many more. 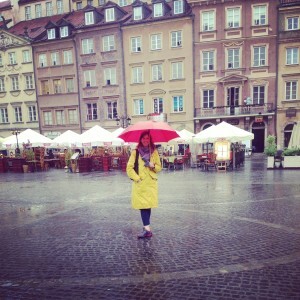 We did a drive by past Schindler’s factory and walked around the market square. Pope John Paul II was canonized that day, so the streets were packed with worshippers, revellers, and fans of the near-local priest who made it to the big time. And then there was the day of the March. 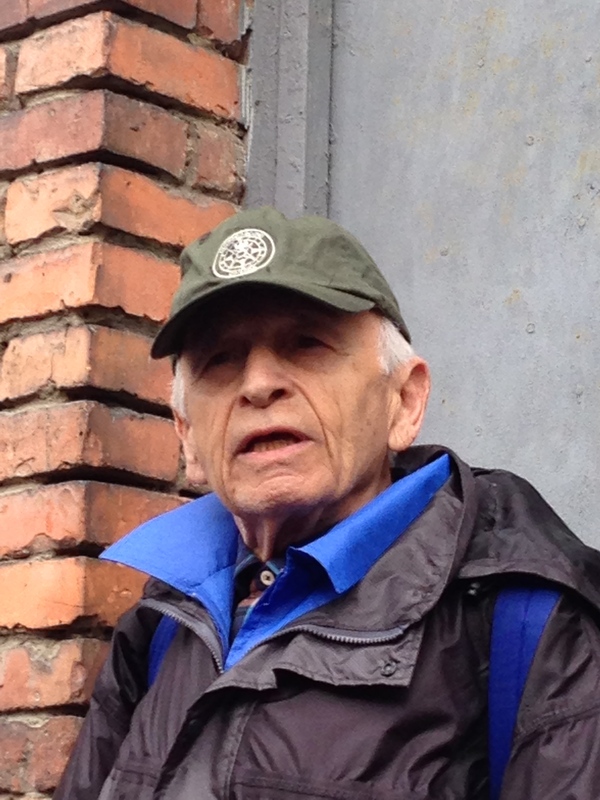 Max Eisen, the phenomenally wise and well-spoken survivor who accompanied our bus, walked us through Auschwitz, the camp where he survived while the remainder of his family was murdered. Clothing of all sizes. Suitcases with the names of adults and children still chalked on them. Prosthetic limbs, canes and crutches. Eyeglasses and shoes. Several tonnes of human hair. All stolen from humans before and after their death, and now on display. Personally, I found it repulsive. I couldn’t bring myself to take photos of such things. Seeing the display cases filled with children’s items – from bonnets to toys to dolls – I lost it. Before: Empty, ready for Marchers. Outside, in between the barracks, were the holding areas for the Marchers. Placards representing over 10,000 people from 40 countries were lined up: Canada, US, South Africa, Australia, New Zealand, Panama, Brazil, Argentina, Mexico, Hungary, Austria, Germany, England, France, Israel and, of course, Poland were just some of the countries from which I saw people. Everyone wore matching blue windbreakers. 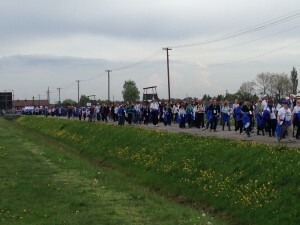 We began our march, from Auschwitz to Birkenau. As far as the eye could see there were marchers in blue jackets. There was no beginning, no end. Poles lined the streets to watch and, contrary to rumours I’ve heard, there were absolutely no people throwing stones or yelling insults. Au contraire. There was nothing but love and humanity along the 3Km route. Traditionally, the march is silent but where we were it was anything but. Israelis sang songs and survivors shared stories. 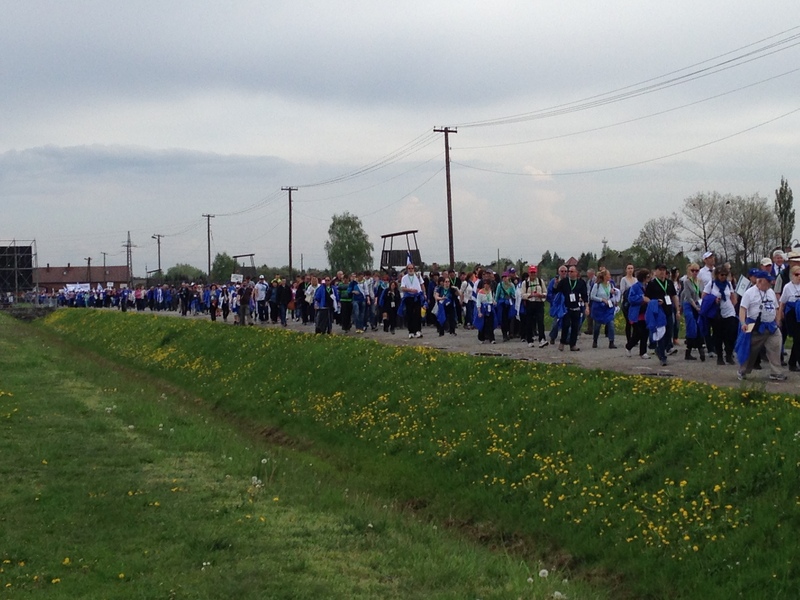 School children from all over, Jews and non-Jews, all marched together in remembrance. 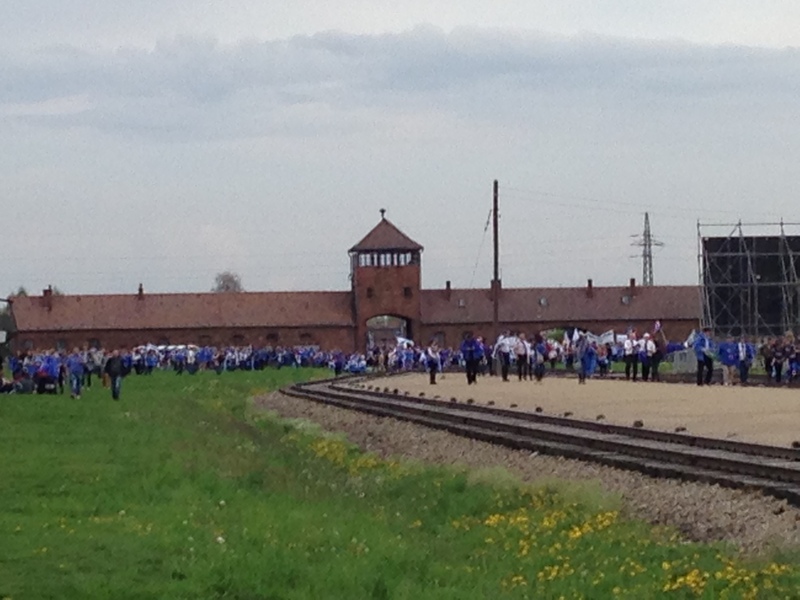 As we entered the gates of Birkenau, we walked along the train tracks. 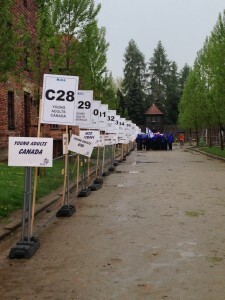 People placed markers in honour of those who had perished. I was walking on behalf of my friend Sue’s mom, Lynn Mumford, nee Lisl Lichtenstein. At age 7 she was sent to live in England. Her brother, Erich, was 12 or 13, too old to be a part of the UK-bound Kindertransport. He perished, along with the rest of the family. Over a loudspeaker, a list of children who had been killed was being read. As people filled into the area, some took seats, some sat on grass, and some simply stood. There were performances, songs and speeches. Among the more memorable speakers were the President of Hungary, commemorating the 70th anniversary of the destruction of Hungarian Jewry; the grand-niece of Raoul Wallenberg who, using his diplomatic office, saved over 100,000 Jewish people before disappearing into the Soviet Gulag at the war’s end; the Head Sephardic Rabbi in NY who ran through a list of Sephardi communities that were decimated. Canadian MP Irwin Cotler, the former Head Rabbi in Israel, and Chilean philanthropist Leonardo Farkas also spoke. Finally, 6 survivors helped complete a Torah scroll that would be accompanying all future marches of the Living. After such an emotional day, I was ready to go home. I wanted – needed – to be with my people. But we had a couple more stops to make. First was Kielce, famous for the pogrom which killed 42 Jewish survivors after the war was over. There was also a beautifully touching memorial to the 45 Jewish children of Kielce who were marched into the cemetery and then executed by Nazis. Vile. 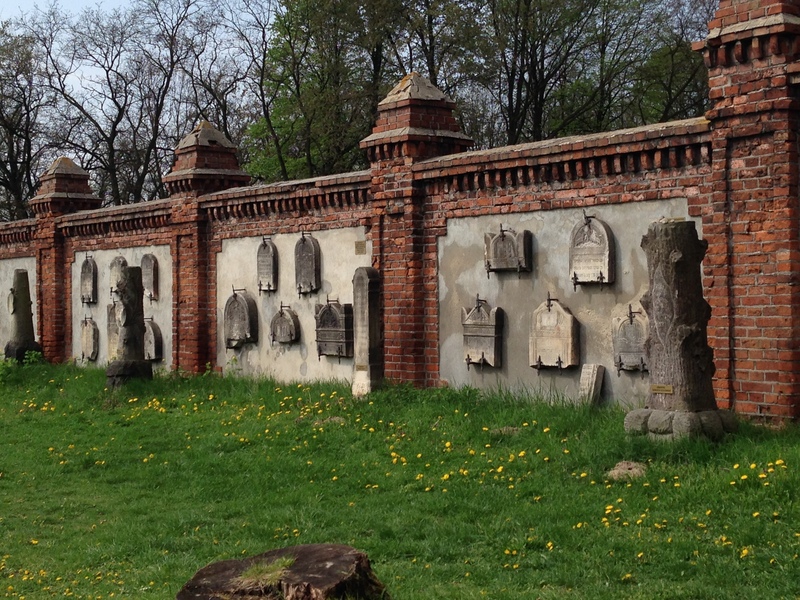 The next day we joined many other groups in Lublin, an ancient site of Jewish learning in Poland. 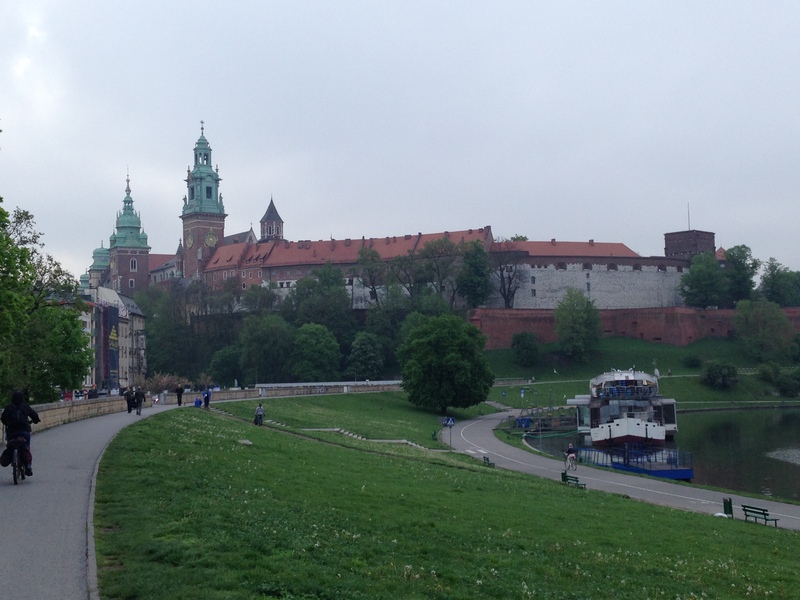 We visited the Yeshiva and then we made our way back to Warsaw via Madjanek. This concentration camp, almost fully intact, is mere minutes from the city of Lublin. It was here where particularly sadistic and chilling stories were set. Barracks still stand, some filled with shoes, others with other remnants of Jewish life. And death. The camp is enormous. At its end, a mammoth stone monument representing the weight of memory covers a mountain of ashes of the victims collected by local civilians and preserved in an open-air mausoleum. 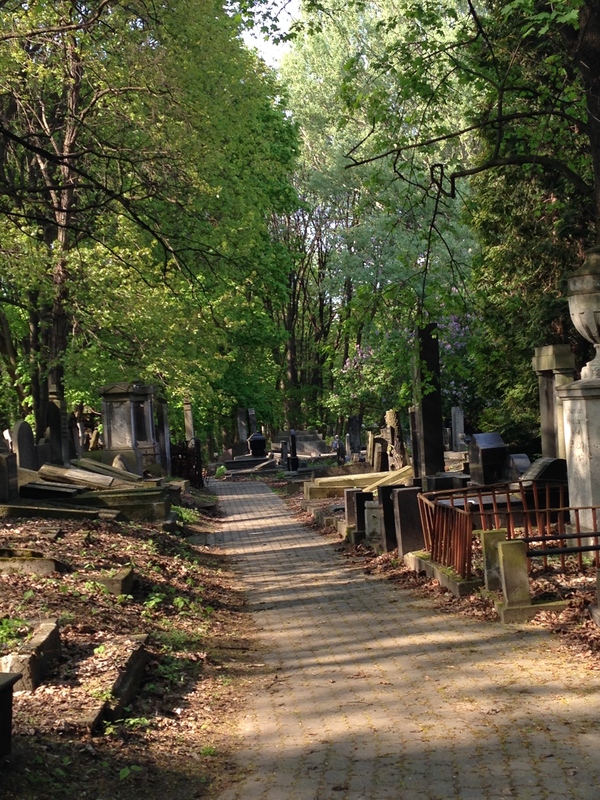 The sun shines on the ashes of the victims of Madjanek. What an intensely moving and incredible week it was. That there could be so much humanity where one of history’s darkest moments took place is difficult to fathom. So many tears shed, yet many uplifting moments as well. I’ve brought home more hope and faith than I left with. For those thinking about making this difficult journey, I can’t urge you strongly enough to do it NOW, while there are still survivors left to share their stories. While the physical structures hold their own meanings, it’s the words and memories of the brave and incredible survivors who accompanied us and allowed us to bear witness that had the most impact. As Mike, our guide, reminded us countless times: it’s the presence of absence, and the absence of presence that leaves us with more questions than answers.